Jingle Jams: A Holiday Mix For The Rest Of Us We all have our own feelings about the holidays — joy, dread, childlike wonder, cynicism, even apathy. Everybody takes away something different. Shouldn't your music do the same? Every song on this mix is performed by monkeys. Every. Last. One. A recent Onion headline read, "Brief Reprieve From Mariah Carey's Christmas Song Comes To Resounding End." "All I Want For Christmas Is You" may have supplanted "White Christmas" on Billboard's holiday charts, but that's a rare coup in the world of Christmas music. Year after year, the same songs start to roll out around Thanksgiving. Attempts at updating the standards — or, heaven forbid, making them "hip" — usually end up in a big glob of gooey badness. Around the holidays, we like our traditions. We go home. We listen to the music that accompanies memories of childhood holiday celebrations, sitting fireside with family and enjoying the freedom of winter break. Occasionally, we take it too far and end up blasting songs that cross the fine line between cozy comfort and sickly sweetness. It's called schmaltz, people, and everybody's got their limit. Sometimes on Christmas, people get dumped or lose their jobs, or spend the night in jail. 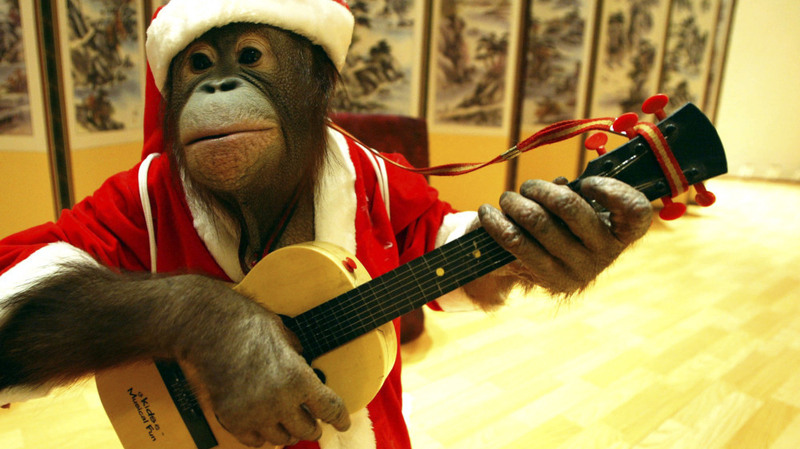 So here's a mix of off-the-beaten-path holiday songs for those people, and for the rest of us. Here, you'll hear artists like Low, Paul Simon and The Pogues seek out the meaning of the holiday, which seems like an especially appropriate endeavor in a time when people are macing each other on Black Friday. On the lighter side, the season remains rife with irreverence. Most parodies are groaners, but the best are performed with a healthy helping of irony. Kitsch is out in full force, so it's a good time to revisit retro gems dug up from the dollar bin. We threw in a few classics, too — from Elvis Presley, Vince Guaraldi and Frank Sinatra, among others — because they always seem to be in good taste. We don't think of this mix as an antidote to your shopping mall's holiday music, but more of a palate cleanser. Everyone celebrates in their own way, so tell us what you play during the holidays in the comments or tweet us @nprmusic. The weirder, the better. This mix was compiled with the help of Folk Alley, WFUV, WXPN and Bill Adler.